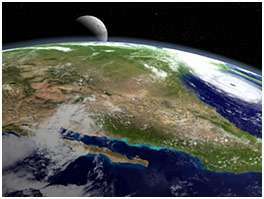 (PhysOrg.com) -- Carbonaceous chondrites are a type of organic-rich meteorite that contain samples of the materials that took part in the creation of our planets nearly 4.6 billion years ago, including materials that were likely formed before our solar system was created and may have been crucial to the formation of life on Earth. The complex suite of organic materials found in carbonaceous chondrites can vary substantially from meteorite to meteorite. New research from Carnegie's Department of Terrestrial Magnetism and Geophysical Laboratory, published June 10 in Science, shows that most of these variations are the result of hydrothermal activity that took place within a few million years of the formation of the solar system, when the meteorites were still part of larger parent bodies, likely asteroids. Organic material in carbonaceous chondrites shares many characteristics with organic matter found in other primitive samples, including interplanetary dust particles, comet 81P/Wild-2, and Antarctic micrometeorites. It has been argued by some that this similarity indicates that organic material throughout the solar system largely originated from a common source, possibly the interstellar medium. A test of this common-source hypothesis stems from its requirement that the organic diversity within and among meteorites be due primarily to chemical and thermal processing that took place while the meteorites were parts of their parent bodies. In other words, there should be a relationship between the extent of hydrothermal alteration that a meteorite experienced and the chemistry of the organic material it contains. If -- as many have speculated -- the organic material in meteorites had a role to play in the origin of life on Earth, the attraction of the common-source hypothesis is that the same organic material would have been delivered to all bodies in the solar system. If the common source was the interstellar medium, then similar material would also be delivered to any forming planetary system. This is one of the Tagish Lake meteorite fragments. Credit: Michael Holly, Creative Services, University of Alberta. The research team -- led by Christopher Herd of the University of Alberta, Canada, and including Carnegie's Conel Alexander, Larry Nittler, Frank Gyngard, George Cody, Marilyn Fogel, and Yoko Kebukawa -- studied four meteorite specimens from the shower of stones, produced by the breakup of a meteoroid as it entered the atmosphere, that fell on Tagish Lake in northern Canada in January 2000. The samples are considered very pristine, because they fell on a frozen lake, were collected without hand contact within a few days of landing, and have remained frozen ever since. The samples were processed and analyzed on the microscopic level using a variety of sophisticated techniques. Examination of their inorganic components indicated that the specimens had experienced large differences in the extent of hydrothermal alteration, prompting an in-depth examination of their organic material. 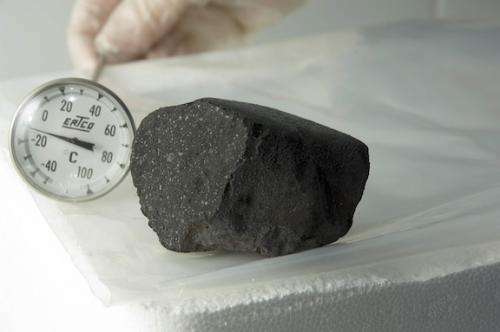 The team demonstrated that the insoluble organic matter found in the samples has properties that span nearly the entire range found in all carbonaceous chondrites and that those properties correlate with other measures of the extent of parent body alteration. Their finding confirms that the diversity of this material is due to processing of a common precursor material in the asteroidal parent bodies. The team found large concentrations of monocarboxylic acids, or MCAs, which are essential to biochemistry, in their Tagish Lake samples. They attributed the high level of these acids to the pristine nature of the samples, which have been preserved below zero degrees Celsius since they were recovered. There was variety in the types of MCAs, which they determined could also be due to alterations that took place on the parent bodies. The samples also contained amino acids -- the essential-for-life organic building blocks used to create proteins. The types and abundances of amino acids contained in the samples are consistent with an extraterrestrial origin, and were clearly also influenced, albeit in a complex way, by the alteration histories of their host meteorites. "Taken together these results indicate that the chemical and thermal processing common to the Tagish Lake meteorites likely occurred when the samples were part of a larger parent body that was created from the same raw materials that formed our solar system," said Larry Nittler of Carnegie's DTM. "These samples can also provide important clues to the source of organic material, and life, on Earth." Were the amino acids checked for chiral activity?